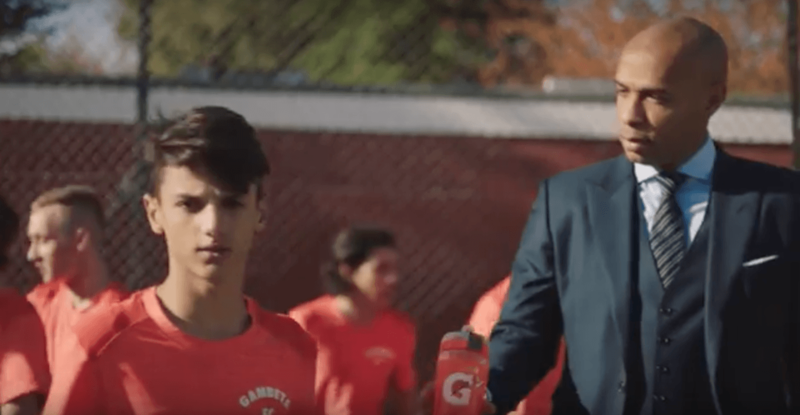 Arsenal’s record goal scorer Thierry Henry filmed the new Gatorade ad in Islington’s Barnard Park last year. And this summer, locals will enjoy the benefits of a donation from the shoot. In the ad, which you can see here, Barnard Park has been transformed into a sunny football pitch, where a boy is being subbed on. Before he goes out, Henry passes him the sports drink. The ad also features FC Barcelona’s Lionel Messi and Arsenal’s Alexis Sanchez, along with players from Juventus and Liverpool. By way of thanks, the production made a donation to Friends of Barnard Park after its 80 cast crew filmed in November last year. Dianne Browning, Chair of the organisation, said the donation was truly welcome and would go toward June events for all locals including Think Like a Pony, bringing ponies to the park for children, a Scruffs dog show and a children’s Olympics. Later in the month, the Big Play Day and Performance event will bring theatre, a band and bouncy castles to the park. There’s more information about the events here.